Welcome back to the Fab Friday challenge over at the Fab Friday Challenge Blog! This week we have a color challenge. And the color challenge selection is pretty much what I used last time for the Penny Black card I made then. It’s very Halloween! Luckily, I still have new Halloween sets left to use, so for this I grabbed Penny Black House of Crows, a fun set illustrated by one of my friends, Mo Manning. GOJUS! I kept things somewhat loose and layered a bunch of colors in the sky. I added touches of Wink of Stella clear to the moon and a few places on the house and landscape. The greeting is from Lawn Fawn’s Costume Party. I wanted a greeting that wasn’t too big so I wouldn’t cover the image up too much. 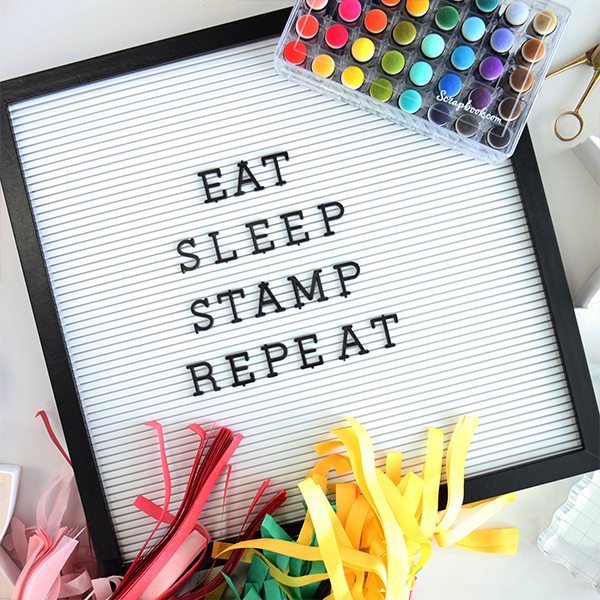 I used the Simon Says Stamp Sentiment Label dies yet again to create this perfect banner strip from the greeting. Penny Black House of Crows is really fun to paint!